So you may have noticed that your Popculteer has indulged in a bit of holiday slacking this week. While I’ve maintained Popcult’s new promise of at least one post per day, I’ve done it by posting videos. I guess the fact that ten of those were videos I made and uploaded on Monday, specifically for PopCult, means that maybe I haven’t got this whole “slacking off” thing down pat yet. Well today we’re going to revisit our Monday video stunt, and tell you what’s in most of the Christmas Treat Packages. We’ll leave the last one a bit of a mystery for technical reasons–I can only fit nine videos into one post. Plus the last video wasn’t much, anyway. The show last week was the first of a new concert series at KP’s Theater on Beauregard Street on Charleston’s East End, and the second show in that series is Saturday night. 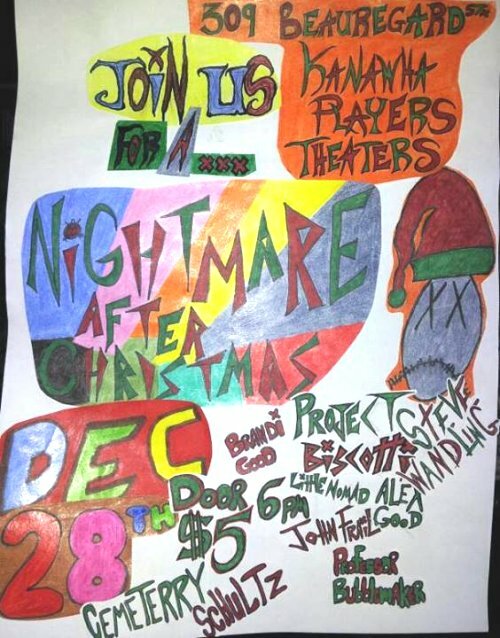 Brandi Good, Jody Herndon, Aleisha Shundoff will perform between two full band sets by the host and instigator of the evening, Project Biscotti. We recorded quite a bit last week, and you will see it on upcoming episodes of Radio Free Charleston and the RFC MINI SHOW. You should check out their show Saturday, it’s only five bucks! Our second treat was a classic toy commercial, starring Major Matt Mason, America’s Man In space. You might remember that I photographed a large collection of Major Matt Mason items and brought them to you just last month. This particular Christmas Treat was excerpted from RFC 16, which I recently remastered. Treat number three is actually one of the recurring features from Radio Free Charleston that we haven’t seen for some time. It’s from the Plant-Ro-Duction Society for The Appeasement of Bees, and it’s from deep in their archives. This silent Plant-Ro Duction Mini Movie is called “An Impact of Great Peril. Our fourth Christmas Treat is Logos and Music. It’s a repurposed ID made for RFC 150 by Frank Panucci, laid over top of the version of “We Wish You A Merry Christmas” that I used to open and close each Christmas Treat. This was just on the off chance that anyone wanted to hear the tune all the way through. One of our meatier treats is our fifth Christmas Treat, in which we delve back into our archives to retrieve a rare performance by John Lilly, Sasha Colette and Jonathan Glen Wood, recorded (I think) in 2010 at the late, lamented LiveMix Studio. This one-camera shoot was provided to me by Adam Harris, who is now a honcho of the head variety over at Mountain Stage. I have way more footage from this night in the archives, so you never know when it might show up. For number six on our video treat countdown, we go back to the childhood of Frank Panucci, and find one of his first animated efforts. 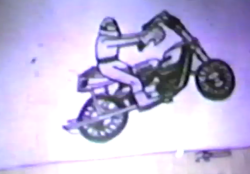 It’s “The Adventures of Evel Knievel,” rendered in cut-out animation on a legal pad form. From these humble beginnings, the RFC Big Shot blossomed into the guy who spends every spare waking moment animating DEVO Energy Domes. Christmas Treat number seven is a double-shot, including newsreel footage of a space Santa, and a commercial for a really cool space-based playset. This couplet of cool first appeared on RFC 89, which was also recently remastered and reposted here in Popcult. Our eighth Christmas Treat is an old RFC ID, tinkerized-with and made all Christmassy. It’s is, short. It’s stock footage from a Turkish Sci-Fi movie, originally tweaked by Frank Panucci, and then re-tweaked by me. The next-to-the-last Christmas Treat, and the final one you’ll see in this post, is another double-shot, only this time it’s TWO COMPLETE SONGS performed by Radio Cult, and recorded at JoeLanta, the extremely-cool GI Joe collectors convention that I attended last March (and will be attending again next March). This band, which includes more than one action figure collector among their ranks, does killer takes on classic 80s tunes, as well as creating their own cool originals. You will see and hear one of their originals this weekend, in our “Sunday Evening Video” feature right here in PopCult. Our final Christmas Treat was a commercial for toys, from JC Penney, which features really creepy direction and a frantic voice over. It was more disturbing than enticing. You can see it here. That is our Christmas Treat, unwrapped. So now you can zero in directly to the videos you want to see, without having to go through the trouble of unwrapping every one. I hope you enjoyed them. It took way longer to put those together than it would have to produce a full-length episode of RFC. Don’t forget to check PopCult for all our regular features.